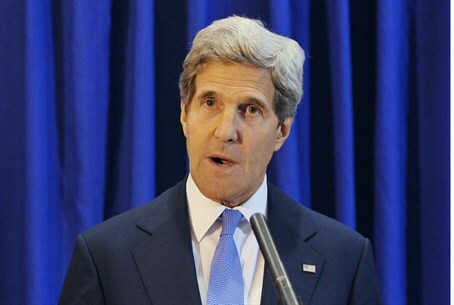 John Kerry accidentally refers to areas controlled by the Palestinian Authority as a country. His spokeswoman: No change in our policy. U.S. Secretary of State John Kerry appeared to have flubbed his lines on Thursday, when he referred to areas controlled by the Palestinian Authority as a country, reported AFP. Speaking at the United Nations ahead of talks with UN chief Ban Ki-moon, Kerry praised the "courageous decision" by Israeli and PA leaders to try to resume direct negotiations. The final status of the areas controlled by the PA has yet to be determined and no Palestinian state has been established. State Department deputy spokeswoman Marie Harf assured reporters later that U.S. policy had not changed. "Our position has not changed not on the status of the Palestinian territory. The secretary was in no way indicating a change of policy," she said, according to AFP. Later asked about his comment, Kerry replied: "Did I say that?" Last week, Kerry appeared to have achieved a breakthrough deal to get the two sides to return to the negotiating table after a three-year break. No date has yet been set, although an Israeli minister said that the talks would begin on Tuesday in Washington. Reports this week indicated that Prime Minister Binyamin Netanyahu intends to free 82 terrorist prisoners in the course of negotiations with the Palestinian Authority. Most if not all of the terrorists were convicted of murder. The prisoners are reportedly to be released in four waves, once every two or four months, as the negotiations advance. There were also reports that Kerry has deposited a letter with the PA in which he states that negotiations will be based on the idea of a return to pre-1967 borders. However, this is denied in Israel.